One side has a Non-Slip resistant surface to keep you in place when you stand on the exercise sliders and the other one is smooth and slides easily. Practice any type of workout, from lunges to squats to upper-body exercises, targeting specific muscle groups and tone your entire body with easy use. We are all about making your workouts both effective and fun. Working out takes time and effort and we know that, so we have worked hard to design and develop workout sliders that will maximize every one of your exercises. Tension in your core and limbs is the key to turn a simple stretching session into a full body workout, and we're supplying you with the exercise sliders gliding discs, extra socks to enhance your workout and the tutorials. Working out at home as well as at the gym is different for every one of us. You must stay focused and do every exercise correctly, which is why we designed items that come up with the best solution so your workout can feel comfortable anytime, anywhere. Our travel-ready strength sliders are lightweight and will easily fit in a small drawer or carry bag. EXERCISE ON ALL SURFACES - Every move counts and now you can better exercise your core with our dual-sided sliders fitness.The gliding discs for exercise have a plastic side for carpets and a foam side for hard floors.With 7" diameter to accommodate both men and women our sliders fitness are the best 80 day obsession equipment.Whether you're using them on the floor at home or at the gym exercising with the disks will increase your strength and get you closer to that beachbody everyone craves. EASY TO CARRY - With the bundled carrying bag, the beachbody strength slides are easy to carry and store, so you can do your complete body slide and sculpt at home or at the gym. This core training equipment containing 2 exercise sliders is travel-ready and lightweight and will easily fit in a small drawer. Think of it as a light, ready to go kit. Whenever, wherever. You are the stretching machine and our core sliders for working out are your special features. EXERCISE LEAFLET & EBOOK - Our fitness expert included 20 exercises in the attached leaflet and e-book to strengthen your muscles. Improve your mobility while toning your abs, thighs, legs and arms obtaining a core workout with the smallest tool you could ever need for the best body. Designed for a variety of exercises, Inovix elite equipment is totally safe and fun to use. We know you have a lot on your plate, so come on board and our beachbody sliders will make everything easier for you. PERFECT SLIDE, NEVER SLIP - The non-slip socks will grant you the stability needed for a full body workout, preventing your feet slipping off the workout slider discs. The gel dots enhance the soles in order to absorb shock, cushioning your stride and assuring your balance on the exercise sliders gliding discs. Now you can engage in any workout routine without experiencing imbalance or joint pain. They are also the hygienic alternative to a barefoot workout, protecting you from germs and fungus. PROTECT YOUR JOINTS AND MUSCLES - You don't need free weight set or a trainer to get that iron ab! Our core sliders can be used in a variety of different workouts -aerobic or dance, awesome cardio, muscle shaping and strengthening moves (great for building muscles) and also brilliant for yoga and pilates. The workout sliders help reduce joint soreness - for your leg, knee, arm, hand, abdominal muscles - significantly and eliminate the risk of injury even for the older generation. 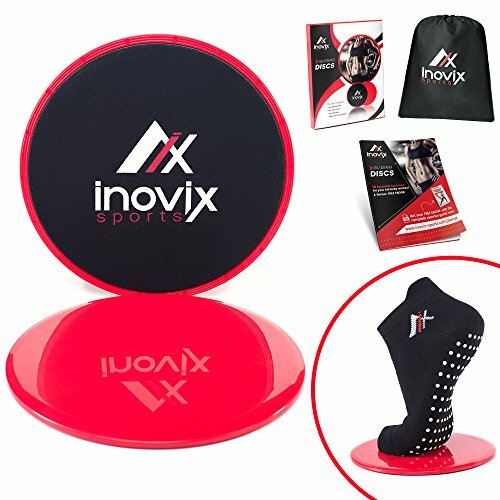 If you have any questions about this product by Inovix Sports, contact us by completing and submitting the form below. If you are looking for a specif part number, please include it with your message.